When I arrived home, I had to get going on the ingredients quick. I was really in the mood for pasta, and the sauce tends to take a little while. After pulling the wine out of the fridge, I had to remind myself what I got in there for. I really needed tomatoes, green peppers, garlic, and onions. Whenever I make pasta sauce I wrestle with the dilemma that I know we all face, “Do I want to drink the wine or cook with it?” For me, it boils down to whether or not I have enough for both. Today I do, so pasta sauce with wine it is! I really like the flavor of a good homemade sauce. If it has wine in it, then I love it more, the more intense, the better. 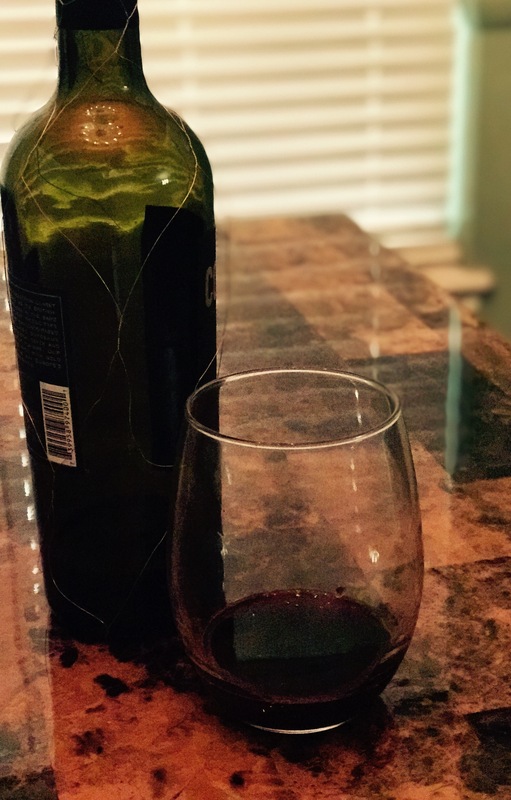 Before I get started, I put on the 80’s music and pour my first glass of wine. My kids respond well to the music, even singing along to some it (of course, they would never admit that to their friends). 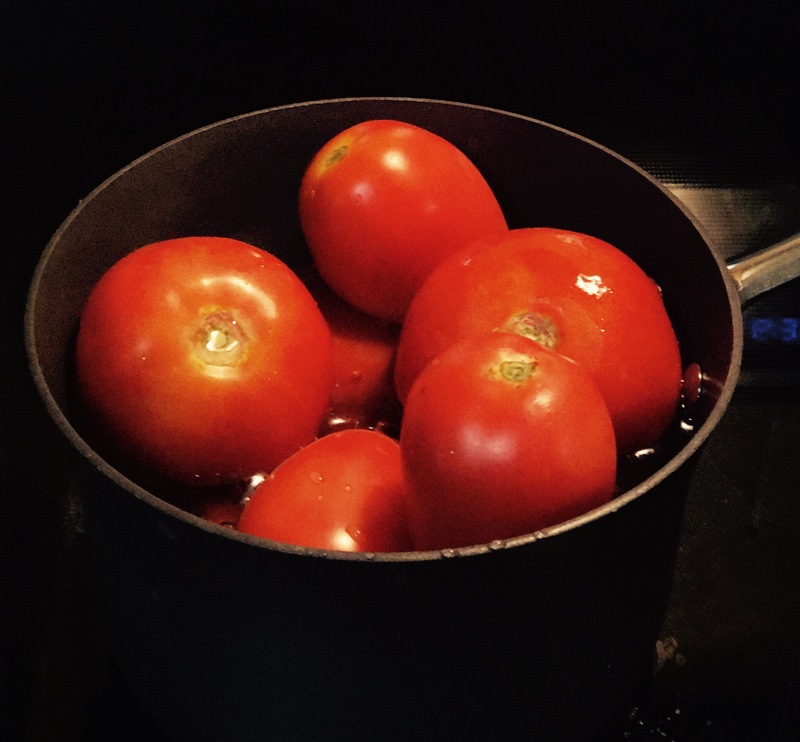 For my sauce, I always start out with my tomatoes. I need them to be skinless. I do this by boiling them for a few minutes. The skin starts to crack and get wrinkly. When this happens, I toss them in some ice water to stop the cooking process. While this is going on, I chop my green peppers and onions. I cut mine a little thick because I like my sauce so chunky it could be a dish all its own. 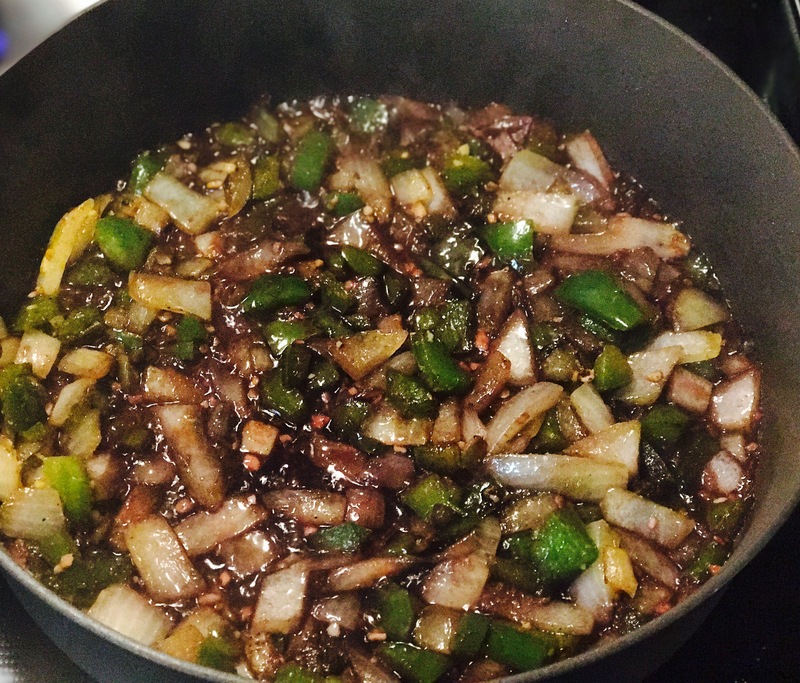 I add the onions to some olive oil with a sprinkle of salt and cook them for a few minutes before adding the green pepper and garlic. When I have added all the ingredients, and they have cooked until tender, I add wine to the mix. I cook the wine down, then I add more. I repeat this a few more times. I like my sauces to have an intense flavor of a good wine. The amount you add will be based on how intense of taste you desire. Today I got off work late and exhausted! There was no way that I was going to cook an elaborate dinner. On my way home I called my daughter to go over new dinner plans, I remembered that I had some mushroom caps in the crisper. All they needed was a quick marinade. As I was on my way home, my daughter put together the marinade for me. She came up with a concoction of balsamic vinegar, minced garlic, salt, and olive oil. She put them in a freezer bag and let them soak up the liquid. When I finally arrived home to my children (and my oh so wonderful yoga pants) I got to work. Since she had done the hard part for me, my job was super easy. I put those beautiful smelling mushroom caps in a pan and let them cook. Cook time depends on how crispy we want the caps. I cook mine over medium-high heat turning them every so often. My son and I like ours crispy so I cook ours for approximately 20-25 minutes. My husband and daughter’s mushroom only cook for 15 minutes since they prefer theirs not so crispy. I love to cook, more importantly, I love to cook for other people. Cooking is how I show appreciation for a job well done with coworkers. It’s how I show my husband and two children that I love and care about them. Cooking has become a way for me to express myself emotionally and artistically. I decided to start a blog because in addition to enjoying spending time in the kitchen I also love to write about, and take pictures of the food I create. It is my way of showing others the cooking skills I learned. My mom taught me how to cook when I was younger, and she did it all without the use of measuring cups or spoons. When I learned how to bake a cake from scratch, I asked “how much of each ingredient?” she would then pour the flour into a bowl then pour a little sugar over the top, then an even smaller amount of cocoa over that. She would explain the correct “parts” the whole way through. Her cakes always turned out amazing using this method. This has been my approach to cooking ever since. I have made some god awful concoctions but eventually learned how to make some wonderful meals. Twenty-five years later I still use this unconventional cooking method to teach my children their way around the kitchen. I show my children that cooking comes from the soul, it’s a form of art. It is meant to be created and shared with the world. Starting tomorrow, I will share some of my favorite recipes that I have come up with. I like to add a lot of color to my food with fresh fruits and Vegetables. I only use fresh or minimally processed ingredients in my cooking.